Moving to a new city is difficult enough. Moving overseas can be even harder. But for the immigrants who came to Boston during the 1960s through the 1980s, getting accustomed to the new place was made much easier thanks to the late Michael Joyce, who had himself moved to Boston from Connemara, Co. Galway, Ireland in 1949. Joyce lived in Dorchester’s St. Margaret’s parish until he lost a four-year battle with cancer in 1989 at the age of 66. This year will mark the 25th anniversary of his passing and a playground in South Boston’s Marine Park —re-named in Joyce’s memory in 2011— is being renovated this summer. 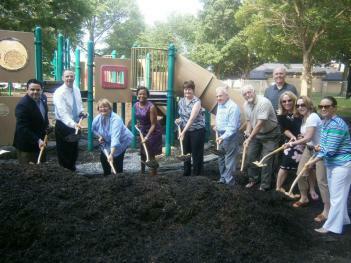 Officials held a ceremonial ground-breaking at the new playground on Tuesday. Growing up in Ireland, Joyce enlisted in the Irish Army and took up the sport of boxing. As a soldier, he won titles like the Battalion Championship, the All- Army Lightweight Championship, and the coveted Lightweight Boxing Championship of Connaught. After moving to Boston, he got his first job at Purcell’s Restaurant on School Street in downtown Boston. There, Joyce met a lot of people from the city and state, building what would become a great network of people who respected and trusted him. He also worked at a courthouse at night and eventually in the 1960s went to work in the Massachusetts Speaker’s Office dealing with immigration issues and helping immigrants with every issue they faced. Working in the State House for two decades, he worked for four House Speakers that included Robert Quinn, David Bartley, Thomas McGee, and George Keverian. It was during this time, Joyce became the go-to guy for many elected officials to resolve immigration issues, according to his daughter, Mary Joyce Morris. When a more than 2,000 people showed up to his funeral with wonderful stories about her father, Mary was stunned to hear about what he did for the community. After his passing, his friends in Dorchester felt he should be remembered after all he had done. “I didn’t feel it was appropriate for me to initiate this, so for this group to reach out to me, it was extraordinary,” said Joyce Morris. Over the past 11 years, the Friends of Michael Joyce searched for public parks that might work for a memorial to Michael. Finally they were given the opportunity to take their plans to Marine Park in South Boston, located on the corner of Farragut Road and William J. Day Boulevard, where a bandstand is located. The playground, which has not been updated for over 20 years, is not handicap accessible, something the Friends of Michael Joyce are planning on changing. Over the years they fundraised through 5K Run/Walks along the beach that raised $60,000, as well as raffling Justin Bieber tickets and participating in opening night for the Red Sox and Bruins, both bringing in $9,000. They also had a runner, Jennifer Scully, participate in the Boston Marathon raising $5,000. In 2011, the state legislature passed a bill to rename part of the Marine Park to be named the Michael Joyce Memorial Playground. “It is a place where on the weekends I used to go, it was a big deal for us to go to Castle Island, we didn’t have a car growing up,” said Joyce Morris of the playground’s location. The Friends of Michael Joyce plan to have new equipment, all handicap accessible, a new toddler lot enclosed, foam underneath the swings and platings, while keeping some of its original structures.